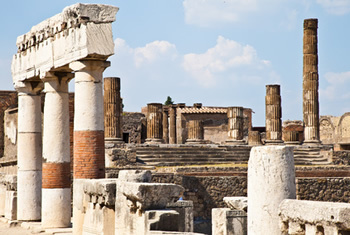 After your meet and greet with your driver at the Hotel or at the accomodation place at the requested time, you will make your way to the archaeological site of Pompeii, the ancient city whose ruins were preserved by the volcanic eruption that devastated it in 79AD. Here you will spend the morning to understand the city which Romans took control around 200 BC. Vesuvius erupted on August 24, 79 AD, burying the nearby town of Pompeii in ash and soot, killing around 3,000 people, and preserving the city in its state from that fateful day. Pompeii is an excavation site and outdoor museum of the ancient Roman settlement. This site is considered to be one of the few sites where an ancient city has been preserved in detail, jars and tables, paintings and people were frozen in time, yielding, together with neighbouring Herculaneum, which suffered the same fate. It's also an unprecedented opportunity to see how the people lived two thousand years ago. Now we will head off to Mount Vesuvius which is the best known vulcano on earth, one of the most studied and is also one of the most dangerous because the vast territory stretching at its base which has seen the construction of houses up to 700 meters high. Once you have reached the parking area, you have to continue on foot using a steep path, 860 meters long, with a vertical drop of 135 meters and an average slope of 14%, which takes about 15-20 minutes on the western edge of the crater (1180m ). The crater can be visited all year round, except on days when weather conditions make this impossible. It has an internal cavity over 300 meters deep, with a circumference of the crater about 500 meters. The path continues among characteristic projections and soon leads to Capannuccia (1170 meters) behind which you can reach the highest point of Mount Vesuvius (1281 meters). 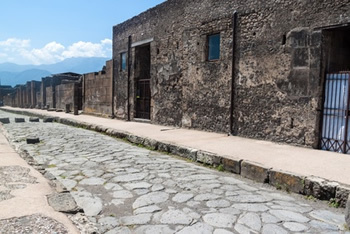 Pompeii is partially wheelchair accessible where as the Mt.Vesuvius no.